Surprise, surprise! It’s not just one Disney mug has been released today. 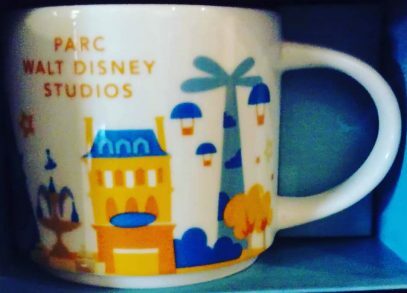 Please welcome the latest addition to YAH Disney family – Starbucks You Are Here Parc Walt Disney Studios mug. To be honest, I had no idea there are 2 parks in Paris. Well, the more the better, right? As for me, I am both excited to add these to my collection and concerned about what it will cost me to get them shipped. Hi, I just bought them for my personal collection and there are more expensive than any other France YAH collection as in Disney, money, money ! Each of them cost 20€ equals approximately 23 USD so if you add the shipping cost, it’s not for nothing. I agree with you, these are expensive. I am not even sure I am ready to pay that much (cost plus shipping).